Katherine Archer in Art & Photography on 29 November, 2015. Edward Hopper’s glorious painting Cape Cod Evening (1939) is, without question, my favourite piece by him. I feel it is an image that comes particularly close to achieving Hopper’s artistic ambition: “My aim in painting,” he explained in his 1933 Notes on Painting, “has always been the most exact transcription possible of my most intimate impressions of nature.”* It is an image that invokes such a strong sense of the beauty of rural America and, in particular, the beauty of autumn. Firstly, the strong colour palette used is characteristically autumnal – when considering the season and its features, the beautiful colours that emerge and transform the countryside are the first to come to mind. This immediately sets the tone of the piece. 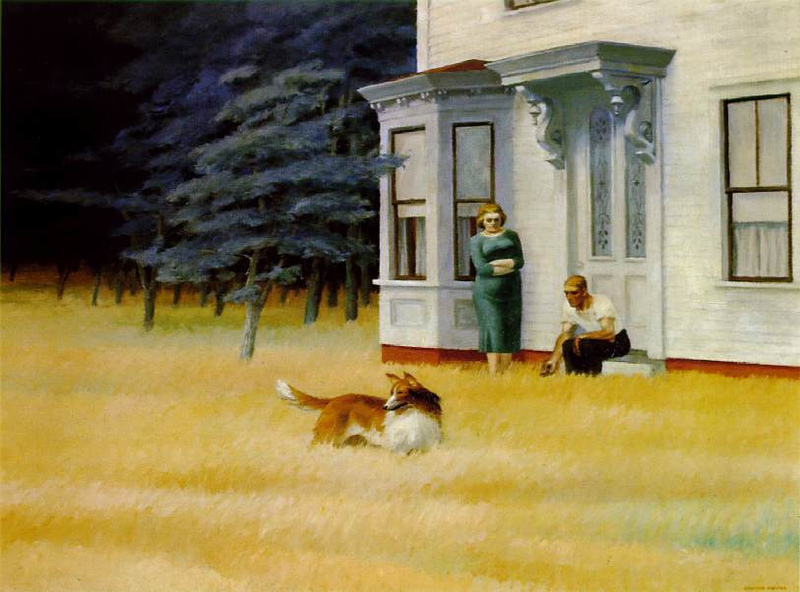 At the same time, Hopper manages to avoid slipping too far into stereotypes: the oranges and reds that sweep across the grass are pale and dominated by yellow tones; the dark blue-green of the evergreen trees provides a stark contrast to the rest of the image and is a novel alternative to the usual staple of deep red leaves, which often prevail in autumn-inspired artworks. The more archetypal autumn colours are, instead, present primarily in the fur of the dog: the painting’s central figure, to which our eyes are instantly drawn. Its deep brown-red coat implies the presence of autumn leaves without actually displaying them. 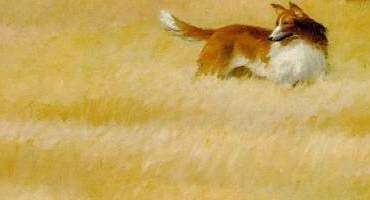 An autumnal palette is similarly used to draw out the two human figures: both are portrayed with hair that is the same auburn shade of the dog’s coat. Positioned by the white wood-panelled house, the green of the woman’s dress, which mirrors the trees to her side, and the brown of the man’s trousers suggest a bond with nature that contrasts intriguingly with their proximity to the large and domineering man-made building that is, presumably, their home and also with their status as human-beings – a group often at odds with the natural environment. It is very interesting, I think, also, that the people in this work take a backseat and it is, instead, the dog and surrounding nature that take precedence; the woman, the man and the house, while key to the composition, are not the immediate focus. Looking through Hopper’s vast repertoire of paintings, for those that feature people, this angle seems to be unusual: it is often a person, a building or some other man-made construction – for example, the glaring petrol pumps of Gas (1940) – that tends to be the focal point. Another aspect of autumn that Hopper manages to capture in his painting is the cool weather. The fact that the two people are not wrapped up warmly suggests that this is not late autumn, but there is a definite suggestion of a chill in the air: the woman’s arms are tightly folded around her middle and the man is holding out his hand to the grass in order to capture the sensation of it brushing across his palm in a breeze. In addition, the slanted and slightly uneven brush strokes of the grass, the trees and the dog’s fur suggest movement and give the impression of being ruffled by a gust of wind. Despite this implied motion of the elements, there persists, as is so common in Hopper’s work, a melancholy stillness. This mood is made even more poignant when considering Cape Cod Evening’s connection with autumn. Autumn can be a melancholy time: it is not as bright or hopeful as spring and summer, bringing with it longer nights and the promise of imminent winter. Put simply: it is the season that precedes death; life cycles are coming to an end and nature is displaying its final – and arguably most beautiful – bloom. Worthy of note is Hopper’s choice to set this scene in evening-time: evening is to the day, as autumn is to the year. The darkness of night is coming but it’s not arrived yet. Despite this, the painting does not suggest hopelessness: the evergreens are resolute against the seasons; as is the house, which is strong, square, robust and prepared for whatever nature may throw at it. Hopper’s paintings have the air of representing a snapshot into their subjects’ lives. Although not the immediate focal point of the artwork, the eye is inevitably drawn to the two people secondarily and it is then that their stories are considered. Hopper gives little away in terms of their relationship or situation. One can assume that they live together with the dog in the white house but anything else is up to the imagination of the viewer. The couple – if that is what they are – do not appear to be speaking or interacting in any way and thus they contribute to the sense of stillness. With so much of the image inspired by autumn and by evening, one considers whether they are, in fact, in the “autumn” or the “evening” of their lives. What awaits them? The idea that something is coming is compounded by the stance of the dog, which stands alert and gazes out into the distance at something invisible and unknown to the viewer. 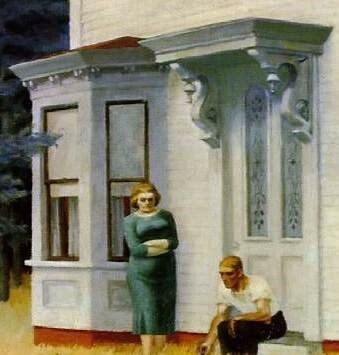 Hopper’s Cape Cod Evening therefore comes together as an image of slightly contrasting messages. In some ways, the painting could be seen as idealistic: the picture it portrays of rural America is one that immediately captures the imagination with thoughts of beautiful and quaint countryside living. On the other hand, the sombre undertones of this work would make it easy to view the painting with a somewhat uncomfortable and troubled air. However, I would argue that the painting, in fact, offers comfort. Quite apart from being idealistic, I think it is realistic. Hopper recognises the imperfections of human life. The seasons and stages of day are commonly used metaphors for life’s course and Hopper certainly seems to draw on this. Just as autumn and evening indicate the approaching end to a year or a day, it is suggested that the subjects of the painting are coming to the end of an era – possibly something as momentous as their lifetime, their relationship together or perhaps their time at Cape Cod. The significant fact remains, however, that they are a part of a beautiful picture. It is a picture that is greater than they alone but to which they are nevertheless integral. The season of autumn is inextricably linked with the process of dying but it is magnificent even so. Although fear, uncertainty, and a degree of hopelessness may be experienced, negative connotations are undeserved; Hopper proves – through colours, composition and details – that autumn is undisputedly beautiful. The end of summer is not something to mourn: the best is yet to come!